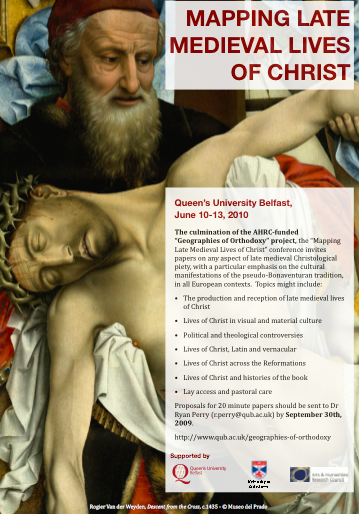 at Queen’s University Belfast, June 10-13, 2010 is now open. Please note: we are in the process of trying to secure bursaries for postgraduate students who are speaking or wish to attend the conference, in the form of a reduced conference fee and travel support. Please contact Dr Ryan Perry if you wish to be considered for such a bursary. N.B. When completing registration please ensure that you provide details of dietary requirements and, if presenting, any computing requirements for your paper. See the relevant field in the ‘check-out’ section of the registration page. Admin | Log-in /// © 2010 Geographies of Orthodoxy project team.